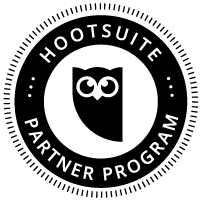 We are proud to announce that we are now a Hootsuite Solution Partner. In 2014 Hootsuite surpassed 10 million users, including 744 of the Fortune 1000 companies. Along with Hootsuite’s web platform, 50% of users access the dashboard through their mobiles including iPhone, Android, and iPad. Hootsuite also offers localized versions of their dashboard in 15 languages – English, French, Italian, Japanese, German, Spanish, Portuguese, Chinese Traditional, Chinese Simplified, Dutch, Polish, Korean, Russian, and Indonesian. We have been using Hootsuite for a number of years now and are honoured to partner together into the future.